Remember when heavyweight champion Wladimir Klitschko called out David Haye in a YouTube video? You remember David Haye, right? He was the polite-sounding, trash-talking, loud-mouth, who was packing a glass toe, and literally talked himself into the heavyweight spotlight without really doing much of anything to actually earn it. Sure, Haye picked up an ABC strap when he squeaked by Nikolai Valuev with an uneventful majority decision victory over the faded aging behemoth. But even before that happened, Haye had already talked himself into title contention by using nothing more than his big loud mouth. It was brilliant! An amazing demonstration of successful self-promotion, the likes of which hasn’t been matched by any other boxer in recent years. And it worked too, even if he did bail out of fights with each Klitschko brother before targeting easier prey in Valuev, for his silly alphabet title trinket that few true fight fans even recognized. It was genius on the part of Haye. But despite all of his talk, it was never clear that Haye really wanted a fight with Wladimir Klitschko, or either Klitschko for that matter. Haye may have been content milking out that so called belt for every penny it was worth, forever defending against the Audley Harrisons of the world. Fortunately for boxing fans, Wladimir did not sit by idly after Haye had used the Klitschko name for his own financial gain and free publicity. 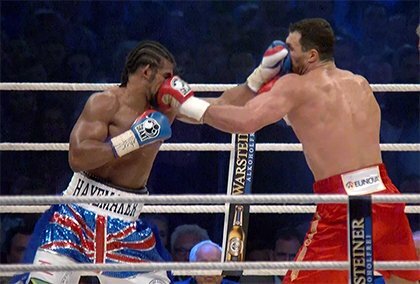 Wladimir wanted to fight Haye, and why wouldn’t he? Aside from being naturally bigger, far stronger, and a much more skilled and gifted athlete inside the ring, Klitschko actually had pride and wanted to establish a legacy. He was dominating what many considered to have been the weakest heavyweight crop the division ever saw, and there wasn’t much happening there to get fans excited. But David Haye, unworthy as he may have been based on actual merit and accomplishment, helped generate some excitement and buzz through yapping. Could this well-spoken British trash-talker actually pose a challenge to Wladimir Klitschko? Lots of fans wanted to find out. Wladimir Klitschko made his intentions clear, in no uncertain terms, and called out David Haye issuing a challenge that was cleverly released as a video on YouTube. It can be seen here below. OK! So the video may have been a bit cheesy, but it certainly served its purpose. Klitschko made his case to the fans, challenged the diplomatic loud-mouth, and drew attention to the fact that Haye had already twice “bitched out” against the Klitschkos. Even though the fight wouldn’t happen for more than another year after the video was released, it generated a lot fan interest, created positive buzz, and may have ultimately put the type of pressure on Haye that was needed to actually lure him into the ring for the fight. While the fight itself was a one-sided exhibition dominated by the younger Klitschko, the point is that Wladimir’s video calling out Haye almost certainly forced his hand quicker than may otherwise have been the case. The end result is, fans got to see the biggest heavyweight fight that they had desired in a good number of years, and when fans get to actually watch the fights they want to see, boxing wins! But today, you might easily forget that. P4P excuse-makers Floyd Mayweather and Manny Pacquiao seem more interested in coming up with reasons why they shouldn’t fight! It’s an amazingly sad state of affairs where the 2 best boxers in the sport have been in the same weight class for 6 years, fan demand for this fight is probably bigger than the demand for any fight in boxing history, and yet these guys just don’t seem to care. They’re making their money anyway, so why should they have a concern in the world for the fans who made their glamorous lifestyles possible? Instead, they have used the fans and basically told them to all go do something unto themselves that is physically impossible to do. Mayweather and Pacquiao ought to be ashamed of themselves, but yet they both continue on, virtually ignoring the very existence of one another as they continue raking in big dough from gullible fans who pathetically argue over worthless details as to who’s to blame, the arguments being fueled by the very excuses that have emerged, endlessly seemingly, from the camps of both Mayweather and Pacquiao. Whether it’s Pacquiao being afraid of needles, or Floyd being concerned for his health, or building an outdoor stadium, or don’t put words in my mouth, or top billing, or drug testing, or purse splits, the endless stream of excuses is pathetic, and the fans who vehemently defend one side or the other are even more pathetic. The only thing Pacquiao and Mayweather seem concerned with when it comes to each other is one-upping the other in the deplorable art of excuse-making. Wouldn’t it be nice if Mayweather or Pacquiao actually took the minimal time and effort required to take a page from Wladimir Klitschko’s book, and call out the other on YouTube? Heck! It wouldn’t even take much creativity to accomplish this. They could effectively plagiarize the exact script Klitschko used, and just replace David Haye’s name with the appropriate name. If either of them had the guts or incentive to do something like this, maybe, just maybe, it would succeed in applying some pressure on the other to finally stop with the sophomoric gesturing of non-intent. Even if one of them didn’t follow Klitschko’s lead and make a video, which is so easy to do in this day and age with social media being what it is, it would at least be amusing if one of them took the Haye route and started trash-talking the other nonstop in polite fashion. I mean wouldn’t Pacquiao look cool wearing a t-shirt of himself holding high the severed head of Floyd Mayweather? Pacquiao and Mayweather have a lot to learn from Klitschko and Haye. This is all wishful thinking, however, because the entire idea of Floyd or Manny making a video calling out the other is predicated on the idea that one of them actually wants to fight the other. And clearly that is not the case, as Mayweather and Pacquiao have both illustrated repeatedly. What a sad state of affairs. You are here: Home / Boxing News / Hey Floyd, Manny! Remember when Wladimir Klitschko called out David Haye on YouTube?